Here at Naturalis Historia we hope to bring a greater awareness of the importance of science and religion in the 17th and 18th century. A time when many discoveries were being made that impacted our views of the earth and its history. Such an emphasis may unintentionally perpetuate the myth that the Middle Ages where dark and completely devoid of serious thought in science and theology. 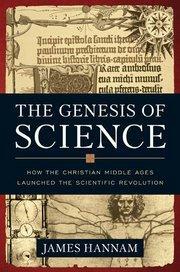 James Hannam’s book, The Genesis of Science: How the Christian Middle Ages Launched the Scientific Revolution, published this year brings some much needed attention to this time period. “Most people still assume that the Middle Ages were a period entirely benighted by violence, superstition and stagnation. Indeed, the triumphs of Greek reason and mathematics had allegedly been snuffed out by Christians once the Roman Empire abandoned paganism in the fourth century AD. Echoing the enlightenment historian Edward Gibbon, some commentators today even blame Christianity for causing the “Dark Ages”. If there was any science in the Middle Ages, they claim, it was either nonsense like alchemy and astrology, or else stolid rehashes of half-remembered Aristotle….